urban immersion Brings youth and adults to ODM for short-term trips to serve, learn, and interact with the neighborhood. Every year, ODM hosts youth groups, school groups, and adult groups that come to serve at ODM for short-term trips. Our vision is to see lives transformed as people gain a bigger picture of the Kingdom of God in urban Denver. This happens through community engagement, educational activities, service opportunities, and the work of the Holy Spirit. Your group will have the chance to serve at ODM and other organizations in our neighborhood, interact with the homeless, and learn about urban issues through a Christian worldview. We house groups in our dorm space on the Westside of Denver so that participants can be fully immersed in our unique urban landscape. We also host one-day immersion experiences for groups of all sizes. We love to see individuals of all ages gain new perspectives as they engage in urban experiences. Email Megan Etter or call 720-975-0103 for more info. Keep reading for details on our week-long and weekend trips. Cost Breakdown: $50/Person/NIght, including lodging, all meals, and program supplies. Contact megan to reserve your spot. Teams stay at ODM's west church campus, Westside Church Internacional. Groups sleep in dorm space with access to two separate showers, a full kitchen, and gym space. Groups will need vehicles to travel to different locations around the city during their time with us. We have four bedrooms with a total of 20 beds, but have room for many more on the floor and throughout other spaces at the church. ODM can host no more than 40 people at a time for service activities, but we can come up with creative ways to host larger groups. Groups must have a minimum of five people. Open Door Ministries charges groups $50/person/night, which covers lodging, food, programing, and service projects supplies. To reserve a date, we request that groups pay a $500 deposit for the scheduled trip, which will be deducted from the final invoice. $500 is the minimum charge, regardless of group size. We recommend that week-long groups come from Sunday - Friday and that weekend groups come from Friday - Sunday. Your ODM hosts will meal plan and grocery shop before your team arrives. Please let us know if anyone on your team has specific dietary needs. Teams will be expected to prepare and clean up meals at Westside. What time of year can we come? ODM hosts groups any time of the year! We also enjoy working with groups that want to join us for a day-long Urban Immersion experience. We require that participants are at least of Middle School age. We have found that elementary school children are too young to participate in the service projects and educational activities. How can I best prepare my team for their UI experience? The Urban Immersion Director will send you a short video and book to equip your team for their experience. You can also have your team and/or church collect new or gently used men’s socks for an outreach to the homeless during your trip. "the trip was definitely a perspective shift for our kids, and for that I am grateful." visiting groups engage in our community, serve, and learn about urban issues. 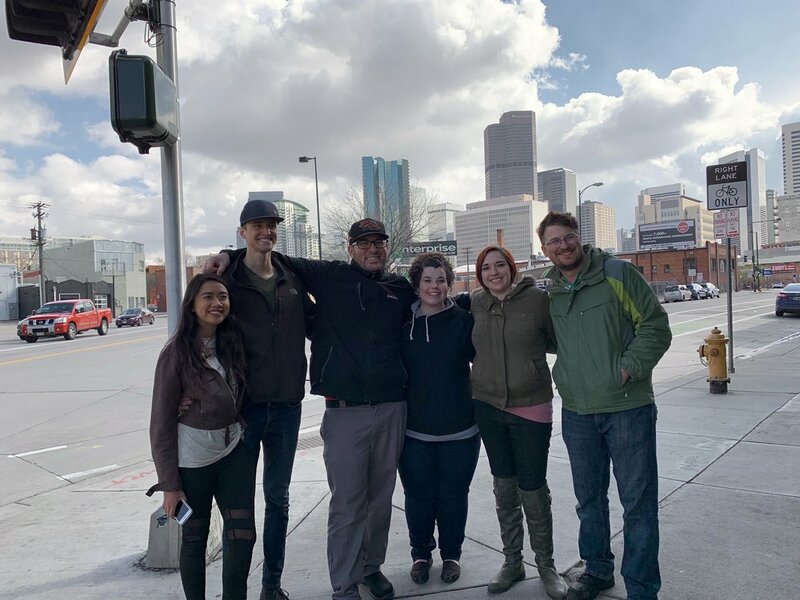 Set out in groups to complete various tasks and interact with homeless people to learn more about what it’s like to live below the poverty line in Denver. Participate in a prayer walk through the neighborhood while learning about the ODM community and hearing stories of people we've reached. Go through an hour outreach training with Open Door staff and then head downtown to have meaningful conversations with the homeless in Civic Center Park and surrounding areas. Help ODM reach kids living on the Westside of Denver by spending an afternoon putting on “Sidewalk Sunday School,” an outreach activity involving a Bible lesson, games, and sharing resources with local families. Serve alongside ODM as need arises. Projects may include gardening, painting, neighborhood cleanup, and deep cleaning. Enjoy a fast-food lunch out with our homeless friends and build relationships over the table together. Serve lunch to our homeless friends in the ODM Family Room and get to know some of the people we reach on a daily basis. Watch one or two Urban Entry videos – they are 15 minutes long and encourage discussion about urban issues from a Christian perspective. Attend Open Door Fellowship or Westside Church Internacional and experience church in an entirely new way! Serve at other ministries in the Denver community, including Denver Rescue Mission, Providence Network and the Denver Voice. Spend one night sleeping outside on the ODM playground to gain some insight into what it’s like living on the streets in Denver. Experience what it’s like taking public transportation down Colfax. Then get a glimpse of what poverty looks like in the suburbs. Dine out at an ethnic restaurant to experience the diversity of Denver, Aurora, or Lakewood. (For groups who stay longer than two nights). Participate in hands-on learning activities that allow groups to look beyond their own needs and explore ideas of poverty and wealth distribution. Begin every day with breakfast and a 30-minute time of devotions. We provide booklets that have been created for your group to explore what the Bible says about working with the poor. "the trip was deeply moving, challenging, and definitely made our students think deeper about their own faith, how to live it, and what it looks like to love those who aren’t like them."